What is working in local search and what is not working today? Last month, Google stopped showing ads on the right side of the desktop SERP. What is the impact of a change like that on your clients? What’s the current balance between focus on local listing optimization vs. traditional organic SEO to boost local rankings? What are the factors that get you in the three pack since it is such a narrow space now? You want to rank in a certain town or city but you’re not quite in it. Are you completely out of luck? What recommendations do you have for getting a business listed on a street that is new? Is there any way to get rid of a Google listing for a closed business? There have been a number of changes over the past year – what is working in local search and what is not working today? Dorfman: When I think about the last year the biggest change that I see is the signal of where you are searching from and what you have searched for in the past seemed to be playing a larger and larger role. Citations and organic SEO reviews and links still matter very much, but so much of that is being trumped by where you’re searching from and businesses that happen to be in the right place and the right time can have big wins. Gifford: Localization and personalization has drastically changed – we’ve really had to educate clients to stop tracking rankings. It’s more important to concentrate on metrics that show how successful you are: organic traffic, impressions, etc. Meraz: I put a lot more focus on link acquisition, building the domain authority, etc. to move the needle to increase exposure as much as possible. Smith: Google’s movements toward identifying mobile as a ranking factor is a really big deal. I also enjoy greatly the reveal in December that a Googler gave us that accidentally validating that CTR can improve rankings – something I’ve long suspected. The impression you make in the search results is something you have to pay attention to. Pay attention to structured data and the photos that show up when people search for you. Something affecting search more now than ever like social activity. Drive your popularity in Google. Gifford: Preliminary results are actually showing an increase in click-throughs to organic results because there are less distractions in the right rail. Meraz: Put a lot more focus on local now more than ever. Even on my laptop, I see the ads and then maybe one or two local results – organic is so far down, you really need to stand out (in local). Smith: I don’t have really good empirical data yet, but for a great many local searches I think it reduced the prom of organic to some degree so I think it’s motivated more monetization of PPC. But for local PPC people, it’s going to increase the competition for those first positions on the page. Talk about attorneys – the places they compete for have winnowed down to four and it’s going to increase the cost per click. Dorfman: It’s on the in the same. The signals are so similar. Getting your citations correct, getting good links point to you, etc. are all incredibly important. So many searches now are local. If you’re not doing everything it’s very hard to show up. Smith: You can’t do one without the other. Dorfman: All the factors matter. If you think about organic optimization there are hundreds of signals, and there are hundreds of signals under those hundreds of signals. If you focus just on three or four, it’s not going to be enough. You have to spread a very wide net and do lots of things right. Provide an experience that speaks the best to customers and potential customers. Gifford: For a lot of us who do local exclusively we’ve had to pivot. Before pigeon it was easy to get people in to the map pack and then pigeon showed up and it became a lot harder. Dorfman: No. you have a massive uphill battle to fight, though. If you can associate your business with that city through content, there’s nothing stopping you from building something out. Most of the links you can get for that are citation oriented. And you’ll have to create content that is 100X better than businesses that are in the city. Meraz: I see virtual offices work sometimes for lawyers. Everything depends, unfortunately. Dorman: It’s possible with virtual offices. I don’t know that I would go for any of the well-known brand name ones though. If you’re a super rich attorney maybe your approach is to have your suburb annexed by the city so you’re in a different area. Smith: Keep increasing references to that location online. Check in services are great for that. But the reality is it’s not going to show up on maps until maps are updated. Gifford: I would say call Google phone support and get them to get rid of it. Dorfman: Close it in all the places within Google My Business. What are some methods for tagging local traffic in Google Analytics? Dorfman: Google My Business is one thing – if you start putting different tracking appendages across all your URLs and appendages, I think that can muddy the ecosystem. Be very very careful in how you do it. That said, if you look at referral sources, it should be clear where traffic is coming from. Gifford: Honestly, we don’t even worry about tracking it. For a car dealership, you already know that your traffic is local. We do seminars in various cities. Is there anything on the local side of search that we can do to combat negative reviews in these cities we visit where we don’t have a physical presence? Smith: I’d have to ask why there would be so many widespread negative reviews? Is there something that’s wrong with the business itself? If you haven’t addressed the core problem you’re just going to repeat cleanup. You could create webpages and entities targeting each of the locations where you commonly go for your seminars in each location to rank for the searches in each of those locations. That’s one way to create content proactively. Also, make sure to address the negative reviews. Share some techniques to get reviews. Smith: Incentivize it. Offer a free dessert, for example, if you’re a restaurant and want a review. You can’t pay for a review, though. How do you evaluate the efficacy of a review site? Dorman: I look at industry first and foremost. For instance, if I think about travel, I want quality reviews on TripAdvisor as well as Google. Google is typically at the top of the list, and then industry-specific sites are right below Google. Meraz: Also look at your referral traffic in Google Analytics and find out what review sites are driving traffic. Should every business be on Yelp? Gifford: The stars that populate on Apple maps come from Yelp, not Google. So you have to pay attention to Yelp no matter what. 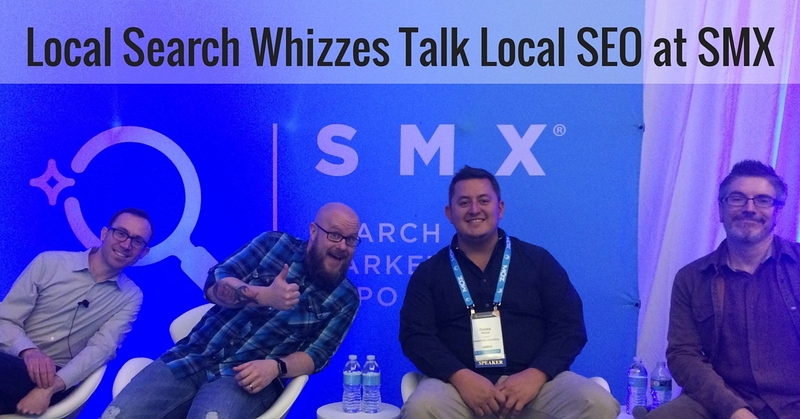 Share a key takeaway on what is working in local search. Dorfman: Market for the consumer not the location. Gifford: Even though we’re talking local SEO, paid Facebook ads are killing it right now. It’s amazing the things you can do with ads and beacons right now. Meraz: Links that aren’t just helping because of authority but because they get in front of your audience move the needle. Smith: I’m continually amazed that solid SEO can frequently beat competitors. Pay attention the the basics. A better resource to use if you need help developing a website that ranks high in search engine outcomes is a search engine marketing authority.